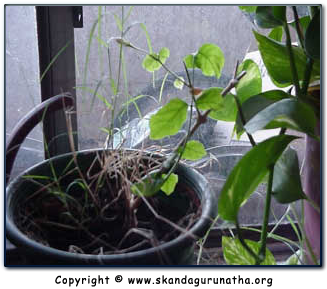 In our little apartment, we have a few household plants ranging from the ever-popular "money" plant to the jasmine (called "malihai" in Tamil) plant (shown below), with which my Lord played His little leela. In late summer (August) of 2000, due to the intense heat, this Malihai plant died. I was busy with my schooling and the other household members, too, neglected to care for and water this plant. One day, after the heat wave subsided, I noticed its shriveled state and I immediately watered it. However, in spite of my efforts, the Malihai plant continued to dry up. All the leaves began to shrivel up and fall off. The main stem began to turn brown with each passing day. Soon, all that remained was the remains of a brown plant skeleton. I continued to water this plant in the weeks that followed but to no avail. It was middle of October when I completely gave up on this plant. My mother, too, was saddened by the loss of this plant because when it bloomed She and I would almost always offer it to the Murugan picture that hangs on the wall in our house (see picture on left). During the month of October, my mother and I were vigilant in observing the Navarathri Fast. Our thoughts and deeds were fixed on the contemplation of Divine Mother. However, we both knew that Kanthar Sashti would begin on Nov. 15, shortly after Navarathri ended. The Malihai remained as I saw it in August, brown and dead. During Navarathri and up and until November 15, when Kanthar Sashti commenced, my mother attempted an innovative and interesting technique. She was saddened by the loss of the plant but was somehow determined to revive it by the time the Kanthar Sashti festival began so that she could offer the jasmine flower to Murugan. This was her heart-felt desire. So, every morning, my mother would take some vibuthi in her hand and sing Thiru-Nyaana-Sambanthar Swamigal's (who is a divine aspect of Lord Murugan) Thiru-aalavaay pathigam ("manthira maavadhu neeru"). The first verse is given below. The ash of Him of Aalavaay; In whom red-lipped Umaa dwells. 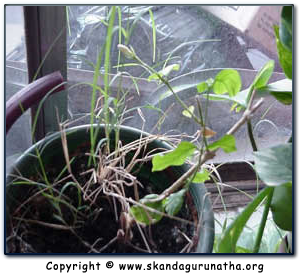 After singing the song, my mother would put the vibhuthi on the plant and then water it. She continued this every day, praying to Lord Murugan asking Him not to let the plant die. My mother wanted to offer the jasmine flower to Murugan like she used to do when the Malihai plant was alive back in July. By the first day of Kanthar Sashti, the following miracle took place. The pictures below show the first bud sprouting from the once "dead" Malihai plant! 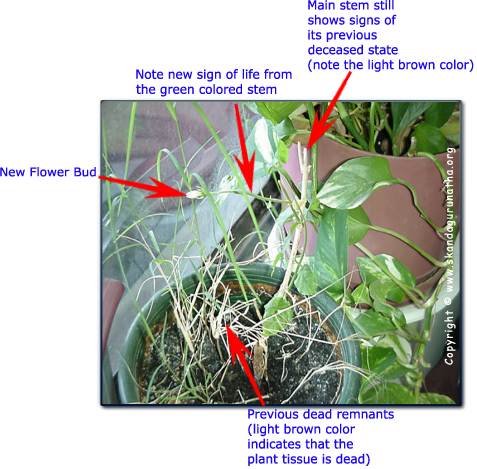 Additional pictures show the plant few days later in late November, with green leaves sprouting from the main stem, which returned to its original green color. When my mother told me about this miracle that went unnoticed by everyone in our home, including myself, I was awestruck. I could not believe the vision that I saw with my eyes. What was dead for several months, suddenly revived itself through the Lord's Grace. From this leela of Bhagavan Murugan, I have learned that even the impossible (death) can be changed by Sri Skanda's blessings. 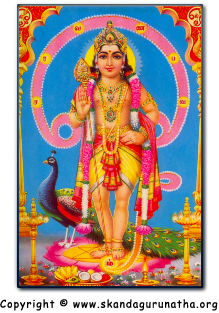 When the bud blossomed into a malihai flower, I plucked the flower, closed my eyes, thought of Sri Skanda's feet, touched the flower on my two eyes and offered it to the Lord Murugan picture that was hanging on our wall [see below]. Yesterday, I had a dream where I found myself in a house filled with many people seated on the floor. They were anxiously awaiting the arrival of a special person. I did not know who. Then as this special guest came to the house, I took a seat amongst the crowd. When I looked up at the figure, it was Sri Sathya Sai Baba. He was wearing the orange ochre robe. As he came to me, I sat down and put a child beside me in my lap and told the child to pray to Baba. He came over and blessed the child and proceeded to go upstairs of the house. I followed him. He entered the washroom of the house and locked the door. I patiently waited outside and a little while later, Baba came out. He washed his hands and then wiped them on a towel and threw the towel to me. I caught and accepted it as a blessing from Baba. He seemed to be in a rush as he briskly went downstairs. I, too, quickly followed. Surprisingly, he went and sat down (on the floor) beside a red chair, on the right-hand side (from my point of view). Baba then picked up a tray with something white on it. My attention was then diverted to the figure seated in the chair  especially the person's feet. I noticed a familiar position in the way the mysterious person was seated. His posture and silambu-adorned feet was one that I have seen before in my prayers and meditations. As I looked upwards to the person's face, I was in pure delight. It was Sri Skanda in all His glory!!! During my meditations and prayers, I always close my eyes and concentrate on the feet of Bhagavan Skanda. But, no matter how hard I try, I cannot focus on the rest of Skanda's form; that of His face and upper body. 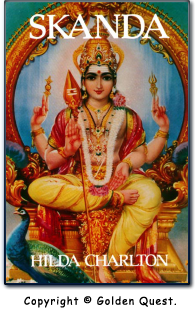 So, in my dream, I looked up from Skanda's feet to see His entire form seated in the chair of our house. He looked and sat exactly as the picture seen on the cover of Hilda's book, Skanda. However, with two small differences - He only had two hands and no Vel. But, I noticed His crowned jewels, nice gold-coloured veshti, flower garlands, gold necklaces and anklets  exactly as pictured on your left. He then beckoned me to come over to Him. When I looked at His princely face, it immediately changed to Ranjan's father's face (a devotee I personally know who has seen Lord Murugan with his two eyes!) and then quickly changed back to Skanda's princely form, which smiled at me with such divinity and grace. Bhagavan Sri Skanda then reached over to a tray held by Baba, who was kneeled at Sri Skanda's feet. Bhagavan Skanda picked up a flower from the tray and handed it to me. I looked at it  it was a very small flower. It was the same Malihai flower that I offered to Murugan when it bloomed from the once-dead Malihai plant! He then beckoned my father and mother. He presented them also with Malihai flowers, while Baba watched like a little child as he was seated at the feet of Lord Skanda. I then awoke. 1. He readily accepts anything, even a tiny Malihai flower, if offered with love. 2. Sri Sathya Sai Baba is a messenger or divine representative for Sri Skanda, and is to be respected. 3. Sri Skanda may choose to bless through Baba, his devotees (i.e. Ranjan's father  who has had real-life darshans of Lord Murugan), and that receiving blessings from them, is equivalent to receiving blessings directly from Skanda himself. "If Sri Skanda's Lessons are heeded to and practiced (as instructed above) sincerely with full faith and devotion, Bhagavan Skanda will show some divine signs or create incidents (leelas) in the lives of those aspirants that are immediately relevant to the current lesson being studied." "I shall instill with you this day the desire to choose your path that leads to the mountaintop where dwells Goddess Jyoti...I, Skanda, Son of Siva, am with you." With this leela, Lord Skanda has increased my faith one hundred-fold and instilled within me the desire to walk the sacred path that leads to His Feet. Thank you my Dear Lord for your darshan, unconditional love, and blessings.